The Book Chook: Children’s Book Review, Where’s Jessie? 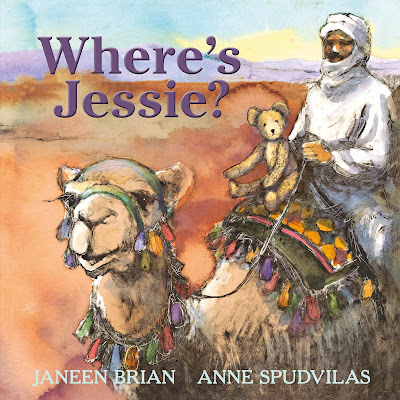 Children’s Book Review, Where’s Jessie? Where’s Jessie? is a children’s picture book, written by Janeen Brian, illustrated by Anne Spudvilas and published by NLA Publishing (2015). In Where’s Jessie? we meet Bertie the teddy bear and his special friend, called Jessie. Bertie was actually a real bear who inspired Brian to write this story. Meeting Bertie in 2011, Janeen said ‘I liked him straightaway’. Janeen found out he’d travelled into the Outback a long time ago, first on a train and then a camel. She ‘daydreamed about a new story for Bertie’. Here she has created a beautiful story for him, a mix of truth and her own imagination. The story is a simple one, but enriched by Brian’s evocative writing and the way we experience the world through Bertie’s senses. When Jessie and her family journey to Australia’s Outback, Bertie is packed into a box to travel with the cameleers. An accident finds him alone, at the mercy of the elements and creatures who sniff and nudge and nip. Bertie is frightened and all he wants is to be safe again in Jessie’s arms. A kind boy eventually finds him and returns him to her. Spudvilas’s illustrations enhance the way we see the story unfold via Bertie’s perspective. The rich ochres and tans of the landscape, the detailed patterns on Australian animals, the delicate lace and button boots worn by Jessie all contribute to the reader’s understanding and knowledge of the setting. School librarians will also appreciate the way Brian has added a section after the story to explain its origins, and give more information about cameleers. The publishers say the story is suited to ages 3+, but I think it’s particularly appropriate for students who are learning about Australian history. I hope children who are lucky enough to have someone share this story with them will go on and daydream an adventure for something they find. Piggybacking on someone else’s idea like this is a fine way to create something similar but brand new, and may well be the inspiration kids need to become keen young writers. Find more Children's Book Reviews on The Book Chook by clicking Reviews in the right sidebar.